If you want to prevent code external to a class from creating instances of that class, you can make all of the constructors of the class private. In the following example, we have a single Dog constructor, which is private. Because the constructor is private, code outside the Dog class cannot create a new instance of a Dog. But we can have a static method in the Dog class that can create instances. 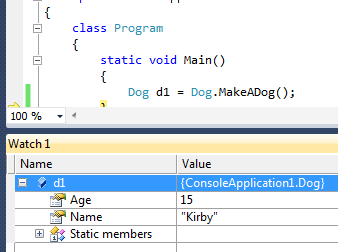 Because the code is defined inside the Dog class, it has access to the private constructor. Now if we want a new Dog instance, we can call the MakeADog method.